Cleveland, Ohio, continues to be one of the shameless leaders in the race to rid itself of all buildings more than 20 years old. 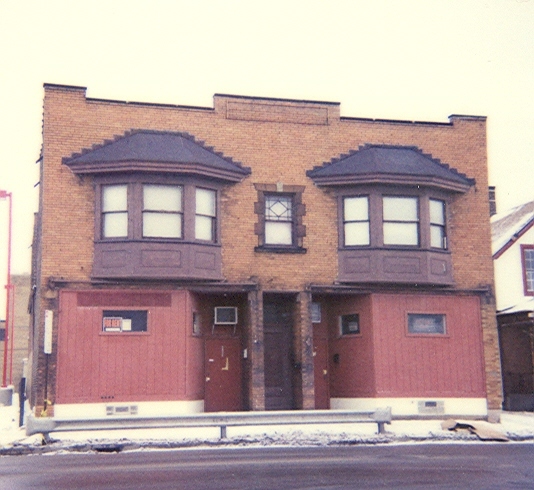 One of the latest casualties was a commercial building, with living quarters above, built in 1911 (see photo). It was in perfectly good condition (although the storefronts had been covered over), but, since it was more than 20 years old, it had to go. It has joined many of its former neighbors, along Cleveland's Clark Avenue, near W. 25th Street, in the city's landfills. Old buildings on Clark Avenue have been "dropping like flies", lately. The neighborhood development corporation is undoubtedly promoting this foolishness, which certainly makes it a lot easier to raze the buildings. There is this illusion that everyone with 'influence' on Clark Avenue has that features all sorts of new buildings, with wonderful businesses, popping up like magic to fill in all the spaces left by these senseless demolitions. So far, the only thing Clark Avenue has to "brag" about is a lot of vacant lots. Meanwhile, its long and important history is being chipped away, building by building. "The only 'good' old building is a demolished one." is certainly the 'motto' on Clark Avenue in Cleveland, Ohio. How do we get a handle on this wasting of regional assets? We demolish what our friends in Knoxville, Boston, and Philadelphia would consider treasures. Where are our values? Our forebears spent extra to give us structures that would last for many generations, and we’re not appreciative of the gift they gave us. We should be preserving and improving on the heritage, not destroying it. We should not be starting over from scratch all the time; we’ll never truly move forward that way. Did the Clark Metro Development Corporation stand accountable for this latest demolition? What is the rationale for wasting the asset? What did the numbers say? I guess I have a lot of questions on this one. Craig, what's the intended reuse of the lot? WHO ASKED FOR THIS NEW FREEWAY, ANYWAY?? MORE LOCAL HISTORY TO BE LOST FOR FREEWAYS??? WHO NEEDS HISTORY WHEN WE CAN HAVE "GREEN SPACE"? KUNSTLER'S CLEVELAND "EYESORE OF THE MONTH"